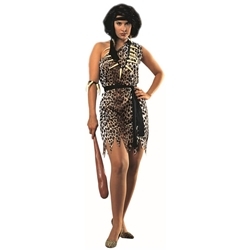 The cavewoman adult costume is a costume classic! The costume can be used as a starting point for a cavewoman or witch doctor costume that is unique to you by pairing this costume up with our selection of caveman and witch doctor costume accessories. The cavewoman adult costume is colored as pictured. Costume includes dress, waist sash, and headband. The cavewoman adult costume is available in adult women's size standard.